Interview questions are by myself, GoSensations.com readers and Lifein19X19 forum members. Q. Are glass stones good to play with? What are the best go stones? A. Glass go stones, being evaluated low here in Japan, are not popular among Japanese players at all. Clamshell (Hamaguri) go stone is the best one to ensure excellent sound and texture in placing go stones. In Japan, Hamaguri clamshell has been used since more than 150 years ago as the highest quality go stones. Recently, clamshell stone has been getting very popular inChinatoo. I have a strong confidence that Hamaguri clamshell go stone are the best. A. In my opinion, yellow cedar Go board is light weighted and easily broken. Kaya Go board is very durable with adequate softness. Here inJapan, more than 100-year-old kaya board is still in use after polishing its surface several times. 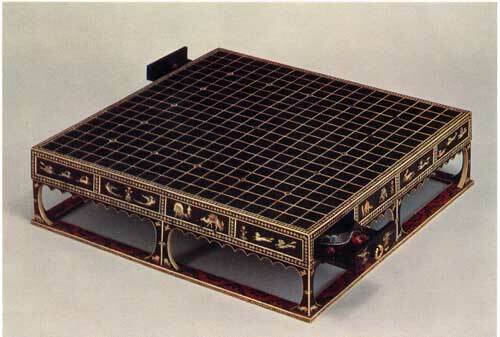 Kaya wood which was buried in the ground for 5,000 years was processed to make a go board and it is also still in use. Snapping sound and texture is almost equal to that of present board. Q. What is the main difference between Japanese, Chinese and Korean Go equipment? A. 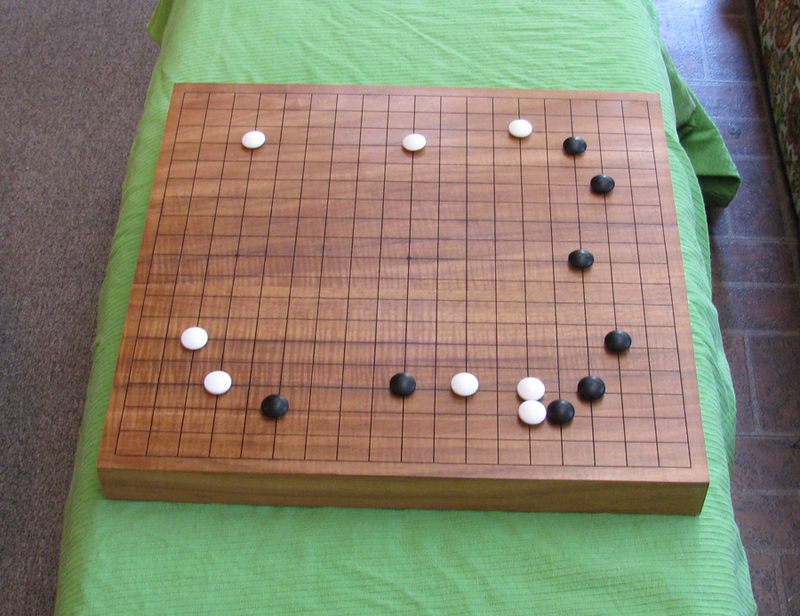 Go was first played in Japan about 1,500 years ago. 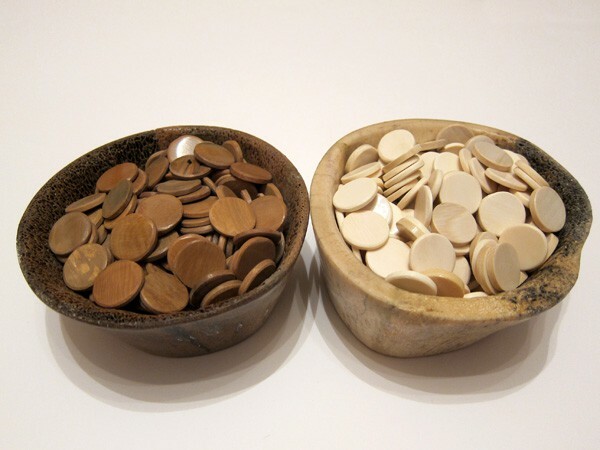 Kaya wood has started to be used for Go board material since the beginning of 16th century. Shogun Ieyasu TOKUGAWA established uniformed Go rules, which is almost equal to the present one. Japanese Go equipment focuses not only on its functionality but also on the beauty of equipment. We have pursuing the perfect beauty of the equipment using the special line marking technique on the board, so-called “Heramori” line marking with the lacquer on blade edge of Japanese sword, the line itself is a little swelled out (a little higher than the flat surface). Korean Go board has printed lines, so the line itself is totally flat. Chinese board used to be 2cm bigger than Japanese board size, but Japanese size is getting popular these days also inChina. InChina, one-side flat go stones are still popular, instead of abacus shaped stones. Q.What was the most expensive goban, sold by your company? Who bought it? A. In my experience, Hyuga Kaya Masame board, 6.5-sun (19.6cm thick) priced at 20 million JPY (US$ 250,000) was the most expensive one, purchased by a president of Japanese real estate company. Q. What do you think about the quality of goban (made from Hawaiian Koa wood), created by Frank Salantrie for Barak Obama (Obama used it as a present to Hu Jintao). A. I have never seen nor touched the board so I am no qualified to answer this question at this moment. 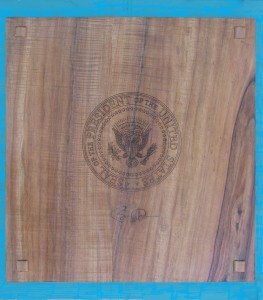 In the coming October, one of our Hawaiian customers is visiting us and he is going to bring Koa wood. His desire is to make Go board with this wood. So I would like to touch and study the wood and make a research on the characteristics when he visits us. Q. Do you know other cases, when goban was used as a present for famous politician, except Obama-Hu story? A. In old days, there was a Japanese custom that local government officials often delivered valuable gifts to central government officials or Congress persons, such as high quality Go board and stones for the purpose to get more budget for local government, but it is illegal activities and strictly prohibited now. Microsoft CEO Bill Gates came over toJapanseveral years ago to give a lecture at a university. 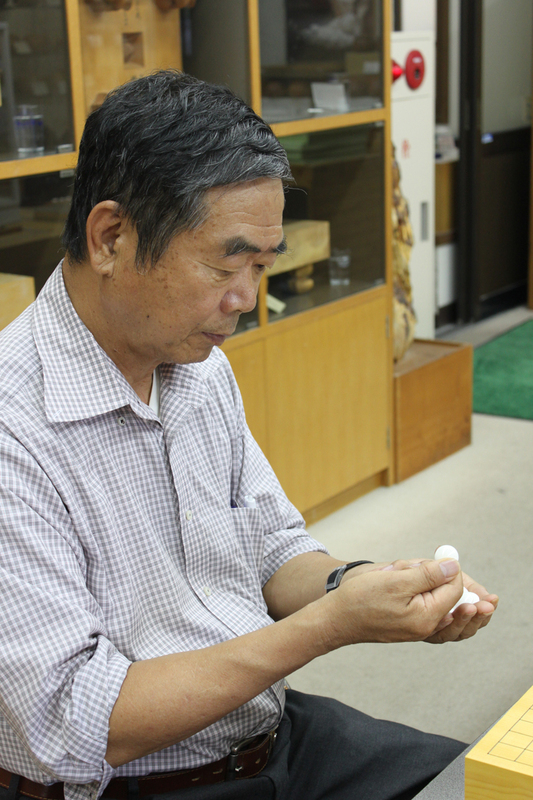 At that time, he was granted a set of Hyuga Kaya Go board and clamshell stones as a token of gratitude. He was so happy to receive it because he enjoyed playing Go game when he was a university student. A. The rarity of this material make this item valuable, I think, but they do not function as Go bowls since they have no lid to put other player’s Go stones. The price and value will be determined by the supplier and customer. Long time ago, I have made Go stones from elephant ivory. Today the Washington Treat prohibits its use so we can no longer make it. If it is possible to make thick Go stones from mammoth ivory, I want to try one more time. Q. Did you see such items before in other countries? What can be the estimated price of such Go set? A. At Shoso-in treasure house of Todaiji Temple in Nara Pref.JAPAN, there is a valuable board with rosewood decoration and thinly-striped ivory is embedded for lines, also jade Go stones are engraved Chinese phoenix or beautiful bird. This set is designated as national treasure so it is not for sale, but if such artist who is capable of making this kind of artistic go equipment is living today, his product will be sold at US$1 million or more. But its seems impossible today as we have no such artists nor materials to make such a treasury equipment. A. First of all, I cannot identify what the material wood is. The criteria will be whether it is made from Kaya, Masame cutting and the size is 42.5cm length and 45.5cm or more width, availability of crack or dents. Anyway, I do not think this board will be priced at so expensive. Q. When selecting a solid wood floor goban, what are the factors we should use to select the best product which fits our budget? What is the order of factors we should look at: type of wood, cut of wood, color of wood, thickness of wood, straightness of woodgrain, density of woodgrain, how long the wood was dried, imperfections such as cracks and knots, the sound a stone makes when placed on the floor goban, the oil content of the wood, etc. A. Type of wood is the first factor to determine the board you want to purchase, then cut of wood, how long the wood was dried, straightness of wood grain, density of wood grain, color tone (oil content of the wood), thickness, sound of stone when placing on the board. Crack and knot are out of discussion and out of criteria. Q. In your opinion, how many more years will real kaya wood remain a viable option for making floor gobans as there is difficulty in renewing a resource which needs hundreds of years to grow to the right size. A. Japan-grown Kaya wood is no longer available as a material for high quality Go board. In our national forest, cutting Kaya tree, which can be processed into highest quality go board, is being prohibited. There are Kaya forests inChina, but it is also prohibited to cut down Kaya trees since 15 years ago. Until 20 years ago,ChinaexportedJapanlots of Kaya wood sufficient to make 200,000 go boards. Myanmar, bordered withChina, still have abundant Kaya trees. Most of the imported Kaya wood brought intoJapanare already processed into Go board and exported back toChinaas Go equipment. I think that Kaya wood will be in stock just for another 15 years, taking our stock, imported Kaya from China, and only a bit of log to be cutting down in the future into consideration. There are some American Kaya, but it is too light weight due to its lower density of wood, as compared to Japanese Kaya. So it is not suitable for Go board. Q. If western hobbyists are interested in making their own table board, what advice would you give them in selecting the wood and in drawing the lines, etc.? A. With respect to material selection, I recommend Masame wood. Itame will bend unless it is dried very well. Cutting edge should be protected using wood glue so that it will not cause crack. Before line marking, please be sure to make the primary surface ready so that the ink will not be scattering. Line marking is totally up to you, so please devise your method. Q. How long does it take to dry the various type of woods before they are used to make table boards or floor gobans? A. As for Japanese Kaya and gingko wood, 1-sun (3.0 cm thick) of wood requires 1 year for drying. So 5-sun (15.0cm thick) requires 5 years. As for Canadian, Alaskan, and Siberian supruce (new Kaya) will be well dried for 6 months, just a half of Kaya. Q. Are there any recommended protective accessories for players to use to transport their table board, go bowls and go stones to go tournaments? A. In Japan, we do not transport Go equipment for go tournament as equipment is already set up everywhere in Go-related gathering. When you have a good idea about it, please let us know. Q. How much more valuable is a wooden bowl with pretty moku patterns compared with one made from the same wood but without moku patterns? A. It is determined depending on the type of wood and Moku condition. For example, Shima-kuwa (island mulberry) has golden moku, Kuro-kaki (black persimmon) has peacock moku, Karin (quince) has ball-shaped moku. Yaku-sugi (YakuIslandcedar) also has ball-shaped moku, it varies depending on the wood. Kusu (camphor) moku is also very beautiful. The highest quality Kuro-kaki (black persimmon) with peacock moku is priced at 600,000JPY (US$7,500) or more. Q. Are there wooden bowls we should avoid using to store clamshell stones? I’ve heard that some woods might stain the stones and others like oak might cause clamshell stones to lose their luster. A. For the storage of clamshell stones, wooden Go bowls is the best match and most suitable. I have heard before that Keyaki (zelkova) and Kaya bowls sometimes stained the stones. Go bowls are processed after totally dried so urethane paint should be applied inside the easy-to-stain bowl in order to protect the stone. Oak wood Go bowls is suite popular among serious collectors with its good hardness and light color finishing tone. Stones luster will maintain, not damaged by storing in the wooden bowls. Q. Do you ever try to research and create new techniques and processes for crafting boards? A. We use machines up to some processing steps. But finishing is the most important and it should be done by craftsmen using their special skill and technique as well as planning (shaving). Good board must be finished by craftsman. Q. Do you ever try to find new varieties of materials and woods that might exceed kaya in quality? A. 150-year-old Hyuga Kaya Go boards are still in use today, all the more they are more beautiful and magnificent than new board. I believe that Kaya board is the best one since even old Kaya boards can be totally revitalized just by shaving the surface, which will produce nice color tone and texture again. I think Kaya is the King of Go board materials. I will not search for any alternative wood. Q: Do you consider the current state of knowledge about board making to be complete and absolutely true? In general, I am curious if innovation (or attempts to innovate) exists in this industry. A. If we install new processing machines, our productivity will surely increase. However, I am afraid that all the board looks same and too uniform and boring. Every Kaya wood have different characters, nothing is same. Planing/shaving direction must be different. All the processing method should be determined by our craftsman and they are responsible for making the best characteristic of each wood in order to finish making an artistic board. I myself am totally satisfied with today’s processing method, the usage of machine, as well as craftsman’s skill. Q.We have seen bamboo become a popular material recently, are you on the look out for new woods or materials? A. I often go to China, at least 3-4 times a year. Now more and more bamboo go boards are being made there. However, clamshell Go stones do not match bamboo board, which is too hard for stones. Bamboo board is suitable for flat-shaped go stones called Unzi. Our company will make every effort to be a leading manufacturing company in of easy-to-use, beautiful go equipment so that we will be able to be loved by millions of Go players all around the world.